One-time folk rockers, Dawes are keen to do things differently on their newest record. "It all runs together, as if by design." 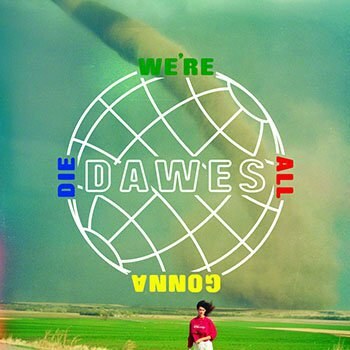 So concludes the final song of Dawes’ new album, We’re All Gonna Die, which is by far their most ambitious to date. There’s something awe-inspiring about this lyric when pitted against the cynicism of the album title. Perhaps Dawes are simultaneously acknowledging the need to adapt oneself but to still remain cohesive, as the artist’s time is limited. Well, Dawes have certainly adapted themselves, but their new album is not all as fluid as the aforementioned lyric claims. While there are certainly some moments when their innovation pays dividends, we are aware that their efforts and finding new sounds are hardly as effortless as they would perhaps like us to believe. From the get-go, Dawes announce that they’re not interested in pedaling their identity as a folk rock group. The album’s opener, "One of Us", begins with gritty synthesizers and coarse drums, generating an almost Flaming Lips feel. The track may not be as intricate as something the Flaming Lips might produce, but it shares the Lips' willingness to experiment. Even if you’re not a fan of the sound that the band has just heralded on this track, it’s at least admirable to hear them going in a completely new direction. Ironically, however, they seem to be at their most captivating when we can still hear remnants of their folksy style. "Less Than Five Miles Away" blends a jazzy feel with folk storytelling and acoustic guitars, warming up to a colorful middle section and then melting away. It seems that this track will leave all parties happy. It has vague folk connections, but also maintains the group’s clear desire to try new ideas. The same can be said of "For No Good Reason", another of the album’s more considered tracks. Dawes suffer for their art, however, as these well executed tracks are balanced out by some that seem to fall short. The group’s efforts at no-frills, almost Spoon-colorful pop tunes don’t always come off well, with "Roll Tight" and "Picture of a Man" being two of the guilty parties here. For all their quality on paper in terms of instrumental skill and stylistic infusions, the tracks never really seem to get going. Dawes are faced with the facts that innovation is all well and good, but this doesn’t mean that the listener will buy into it. There are other examples when the band simply overwhelm us with their new ideas. The piano countermelodies on "As If By Design" quickly become intrusive and annoying. The same can be said of the band’s love of close vocal harmonies which, while effective at times, are a bit overused. But then, maybe Dawes are okay with all of that. With their tongue-in-cheek lyrics and infectious electronic sounds, it sounds like they’re having a lot of fun, and that does flow to the listener to some degree. Single "When the Tequila Runs Out" is a good example of this, as we’re treated to the quirky story of a raging house party. There’s a slight similarity between this and the aura of Red Hot Chili Peppers in their glory days, although we’re still aware that Dawes are very much a band harnessing the power of modern electronic sounds. Singer Taylor Goldsmith even sounds like Chili Peppers’ Anthony Kiedis at times. It won’t be enough, however, to convince everyone that this album is the real deal. The record is an outlier, but not necessarily always in a revolutionary kind of way. Often, the band fail to meet the challenge they’ve set for themselves, be it in their instrumental, harmonic, or other choices, and we’re left longing for more of the moments when they do get it right. It’s just a pity that these moments seem to be so rare.